Field of Promise | Indestructible Ideas! 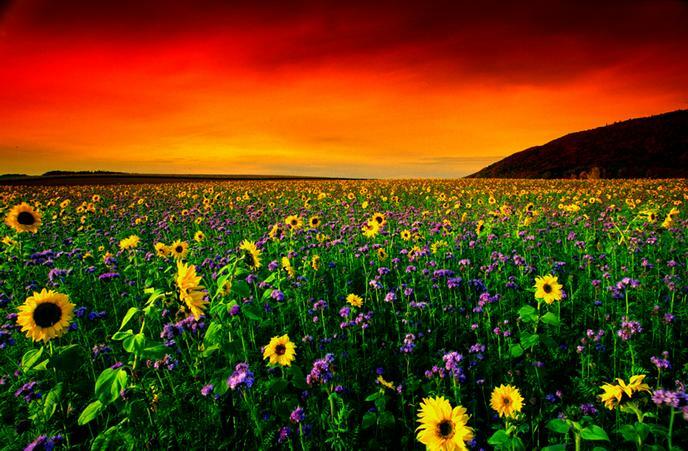 There once was a field of flowers that stretched miles and miles wide. Gradually, these flowers blossomed to perfection. The colors matched those of a rainbow. It was truly astonishing — so dazzling that bugs would starve themselves in order to not damage the flora.Years and years passed, and yet nothing impeded the splendor and majesty this field bestowed. Even tornadoes and hurricanes would avoid this field of promise. Spectators were a constant, their eyes were fed beauty and their hearts were nourished with love.While the sun was burning bright and donating its rays to the flowers, a storm set on ruin began to blot out the shine little by little. The vivid and diverse colors eventually became one of darkness and shadow. Tumultuous winds, enraged and resentful, assaulted the field.Leaves became suicidal and jumped off the stem to avoid the pain. While others stayed on, in hopes of surviving the struggle. Ultimately, they were forced off, shred by shred, leaf by leaf. The winds sought no survivors and even ripped out the roots. Hours and hours of rain and winds finally subsided.There is a field of flowers that stretches miles and miles wide. But these flowers no longer blossom; they’ve been killed, and now, are withered away. Casualties are in the millions, the leaves lie lifeless. This field of promises became a field of lies. Colors evacuated, spectators left, and light was absorbed into dark. Heart can no longer pump!My insides have been ripped out; bloody, limp, and dangling outside my stomach like tree ornaments. I am an empty canvass, the paint ran away.What good is my chest without a heart? Keep my heart, I don’t want it back, I’d rather not feel! I’m an airless tire, a drunk without a drink, a light without a bulb, soil without seeds. You’ve taken my breath and never exhaled it back to me. I am alive, but not living. I see paradise but can’t enter. Happiness is close but I can’t touch it. I’m a tongue without taste buds. I am a vast ocean; touching all surfaces, mimicking and molding into all shapes but, with no waves. I’d rather you throw my heart into a pit of fire so the flame could color my heart black. I wouldn’t have to bear it any longer if you did. Instead, you tear it in half and wear it under your shoes. I can never look up, I’m always down; a slow gradual continual pain. My heart is on an assembly line of despair. It’s getting punctured, hit, and torn till the end result: agony. You seized our love, strapped it together, and threw it in a hole, only to bury it. Now, our love is smothered, fighting for air, suffocating slowly. You are a storm and I, a broken windshield. I’m the day without the sun, a musician without an instrument, the singer without a voice. You’ve left me empty like a homeless hand. You mutilated the stroke of the painter. You’re cadaverous! Cadaver is my heart! Cadaver is our love! It’s hard to look back and see the good times now because you stole time. No future, nor a past. You froze the “now”and currently I’m encapsulated not by ice, but an atmosphere of obscurity, regret, and isolation. I know that I can feel now, I’m alive. Yet, so many people are out there who are jealous of such pain. How they must yearn for feeling, but can’t because they’ve built up walls and barriers around their hearts; too scared to deal with heartbreak that they inhibit themselves from experiencing love. Don’t complain about heartbreak, delight and bask in the beams of emotions. You are a human undergoing a human experience, value it! To the calloused, the emotionless, and the coldhearted; may you remove the wall you inflicted yourself with! May you shatter it down and allow love, joy, and pain to enter. Like a flower, you will grow, troubles will come and troubles with go, but living is a constant. Just live. You took a hatchet to my heart, but only because I let you. It’s my heart, not yours. I changed my mind, I’m taking it back. You are nothing without my pain, leech off another’s heart. Without suffering you cannot live. There once was a field of lies filled with scars of a painful past. It stretched miles and miles wide. Time healed the scars and now the flowers have blossomed healthier and larger than ever. New roots grew, new flora cultivated, and new spectators came. Colors never seen before were birthed. The winds were no longer angry, but kind, gently soothing the fabrics of leaves. There is a field, a field where dreams could be answered or promises broken. It stretches miles and miles wide. This field is love, this field is pain, this field is life, you are a seed, pick a field and grow. Interesting that you compare yourself to a field of flowers that has been damaged by a storm. Nice imagery. I especially liked the invitation at the end!